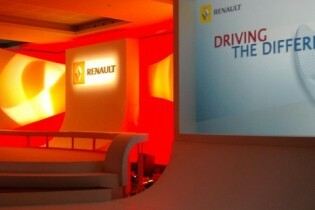 We constructed four adjacent oval stages, along with a series of white filled cloth flats – providing a backing for two rear projection screens and a central logo panel. 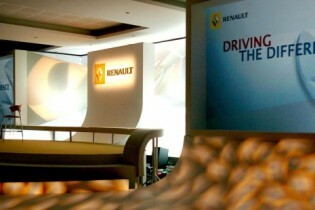 The logo panel curved seamlessly downwards to blend into the staging, whilst the boxed surround also curved and swept down into the lowest stage. The boxed surround screen continued smoothly round and across the stage to form a white upholstered bench seat.